Prestonfield is a non-denominational, co-educational school for children of both primary and nursery age. It is located in South Edinburgh and has stunning views of Arthur’s Seat. The Pod has already moved once within the school and is now housed in the nursery area. It is a slightly different design from our other Pods and is based on a much lighter pop-up marquee. 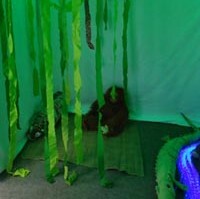 The picture shows the Pod themed as a jungle, ready for story telling.